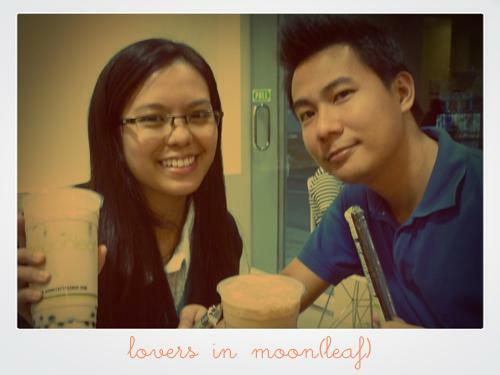 I already had plans gracing the soft opening of Moonleaf Tea Shop after I posted about it last week here. I’m new to the milk/bubble tea phenomenon and rather curious about it so I told myself “Why not?“. The store is located along Pelaez Ext. across the basketball court adjacent to Bangko Sentral Cebu. For the college crowd going to USC Main or Cebu Normal University, the Moonleaf Tea Shop is a welcome break from the local carenderia and eateries. It’s clean, cozy and air-conditioned. As you go inside, you’d be greeted by friendly faces – staff and patrons alike – so you’re sure to have a good time. As it was my first time to order milk tea, I was quite apprehensive about what flavor to try. I didn’t want to end up with something I’d hate thereby affecting my opinion of the store. Finally, I settled on a fruit-based variant – a Lychee Jasmine Tea – a light refreshing concoction that ultimately set the bar for future milk tea flavors I’d try. (Actually, no surprise there as I’m a fan of all things lychee. ) The tea was not too strong to overpower its lychee-ness, yet it wasn’t too weak either not to make a favorable impression. Overall, it was just right for a budding milk tea enthusiast like me. Now here comes the best part: Moonleaf’s offerings are just darn affordable. The teas range from Php 45 to Php 85 depending on the flavor. And they all come in tall/grande glasses (as in!). So it’s super sulit to have one while waiting for your friends on the way to your next gimik or even as you’re hitting the books before a major exam. 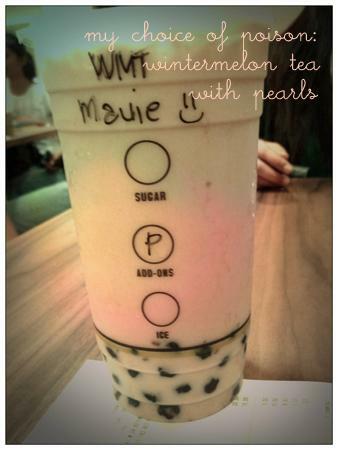 Add Php 10 and you can have your choice of add-ons (pudding, nata, pearls or milk) for a more festive tea indulgence. 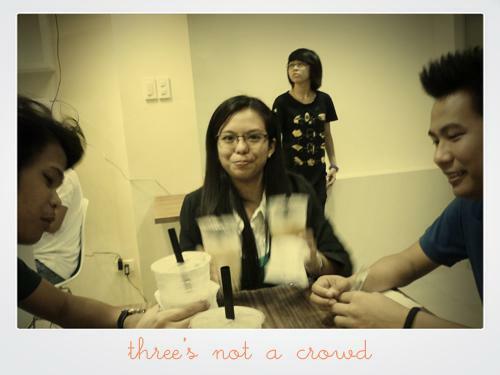 Bonding with friends over milk teas could become weekly rituals even on a tight budget. Even more incentive for me to visit the place again (admittedly, I didn’t know that they were having a contest but it was fun winning, nonetheless ). And so I went with back-up (read: friends) this time. 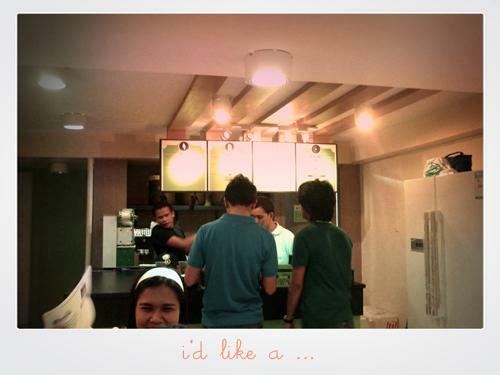 Francis had Hakka Milk Tea; Julie, a Caramel Milk Tea, and DJ was feasting on Nata Milk Tea. Mine was an inspired Wintermelon Milk Tea (the FREE drink I won). Needless to say they were all yummy (we sampled each other’s choice drink so there..hehe) We had such fun talking and taking respite from the rain (yup, it’s that time of the year na to whip out your umbrellas) that we didn’t notice we’ve been there for more than an hour already. Here are some of our tea-licious memories. A big and well-lighted signage at the store front to make it easier for newbies to locate the place. Smaller-sized glasses especially for those with lesser tea-ppetite. Of course, they’d be priced accordingly. Pastries or some other stuff to munch on as we nurse our milk teas. Less bulky tables/chairs to accommodate more (though I pretty much love the white/green/brown theme they have already). Maybe bar stools at one side for those enjoying teas for one? Perhaps, a security guard to ensure customer safety as it gets dark? And probably, a couple of posters announcing new flavors or whatnot as visual enticement. 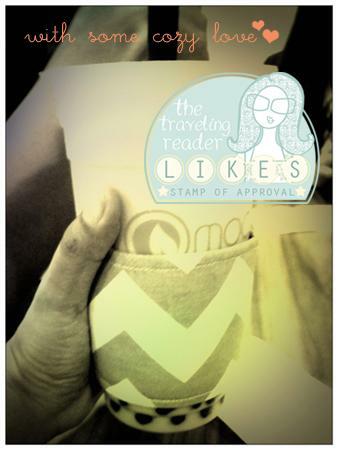 And because I had fun being initiated into the milk tea craze, I give Moonleaf Tea Shop my stamp of approval. If anyone asks, I’ve been toting that coffee cup cozy/sleeve everywhere. Images taken using a Panasonic Lumix DMC-F2 and edited using Pixlr. © The Traveling Reader, 2011. NOTE: This was not a paid review. 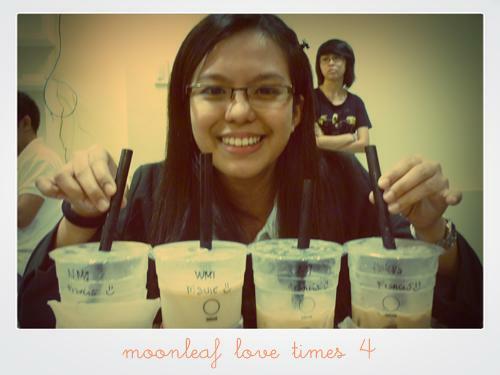 My winning a free drink did not affect my opinion about Moonleaf Tea Shop in any way whatsoever.